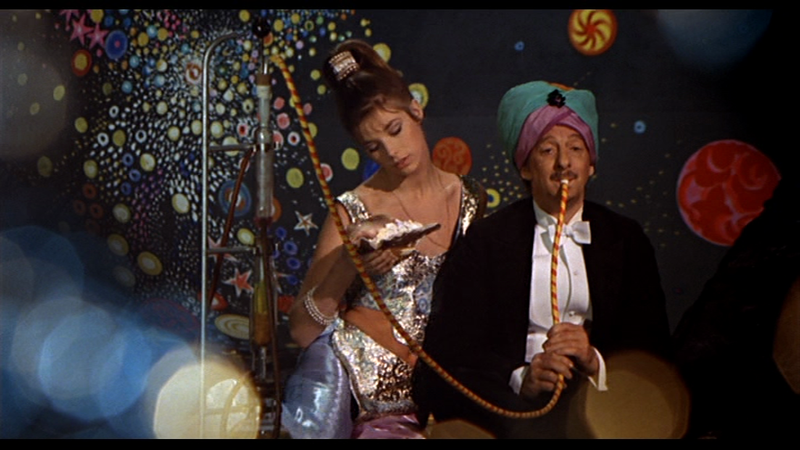 The death of production designer Assheton Gorton (last month, but I just recently learned of it) got me thinking about his unique contribution to sixties British cinema. 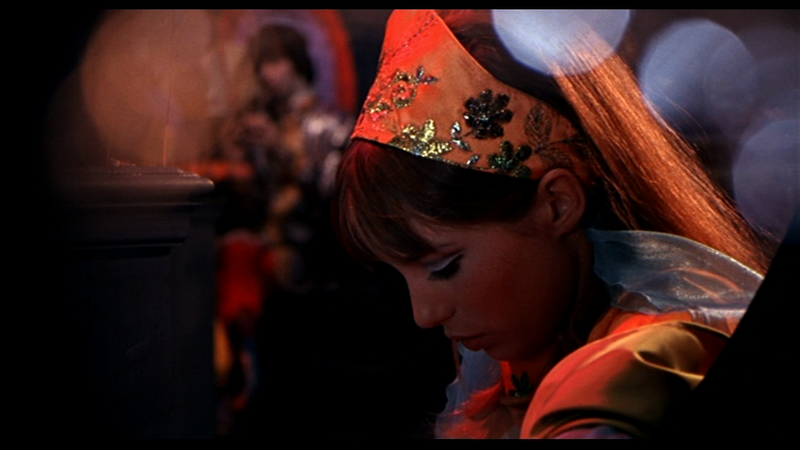 Joe Massot’s WONDERWALL (1968), above, was an early sign of the new decadence, a film made almost entirely to spend the Beatles’ money before the taxman got it, which is not the noblest artistic purpose, but clearly everyone involved wanted to create something beautiful — more beautiful than a hospital ward or a torpedo bay (even a really nice one). And they succeeded. 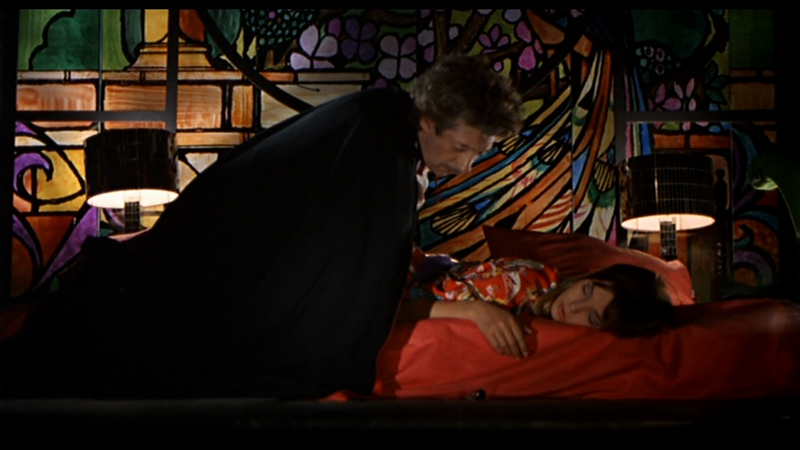 I do get a ringing alarm bell in films about fantasy versus reality where the filmmakers can’t resist making the reality just as lovely and strange as the fantasy — MIRRORMASK, or THE CELL could be chosen as examples. WONDERWALL has this problem very badly — it plays a little like THE ZERO THEOREM, with its mundane protagonist twisted so far into eccentricity as to become insane and alienating, depriving us of our Dante or Virgil in the labyrinth. Some might argue that BRAZIL is oppressively fantastical too, but that’s the point for me — the reality is desaturated and bluish and oppressive and insistently real, and the fantasy can do its job effectively in such a context. 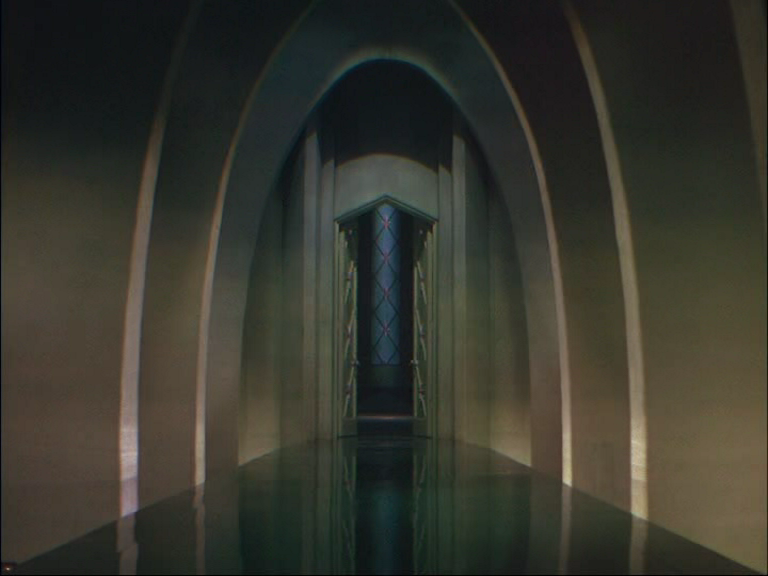 If everything is fairytale, there’s no contrast, and movies love sharp contrasts. Whatever the opposite of an everyman protagonist is, Jack MacGowran is it. A kind of “no-man protagonist,” or “notagonist,” if you will. An actor whose quirks and accent and 24hr inebriation can make him fascinating at the same time as incomprehensible and utterly opaque. Apparently on KING LEAR he had no idea what he was saying. The trouble is, neither do I. Whereas, oddly, he seems to totally get Beckett, and makes me feel I do too. Still, Gorton did a gorgeous job, though some shots are actually little more than beautiful actors in beautiful fabrics and patterns, beautifully lit, with not a wall or piece of furniture in sight. Obviously it was BLOW-UP, on which A.G. served as art director, that got him WONDERWALL. 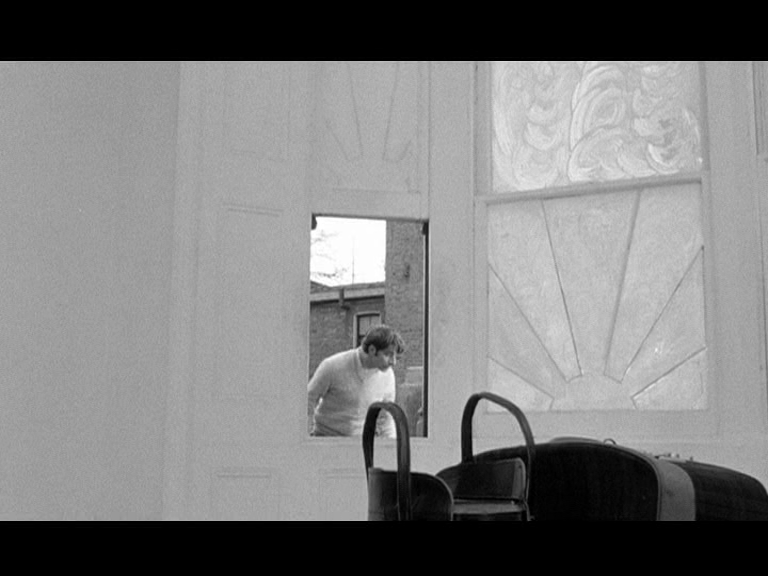 I suppose the job title is correct because Antonioni appears to have built no sets, but he transformed locations, painting a street various shades of gray, and even the people in it, so that David Hemmings’s skin becomes the only thing telling you the movie isn’t b&w. 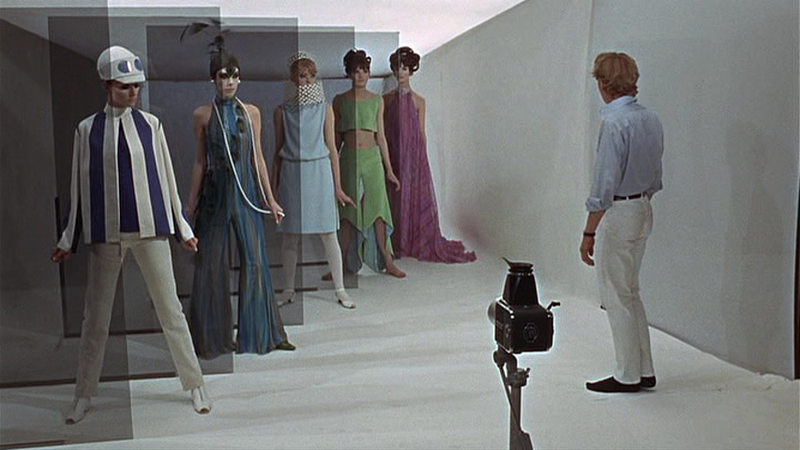 Elsewhere, colour is insistent and striking, though Antonioni still prefers a sort of metallic pastel palette, distinguishing his work from the screaming psychedelia that was beginning to explode in reality. 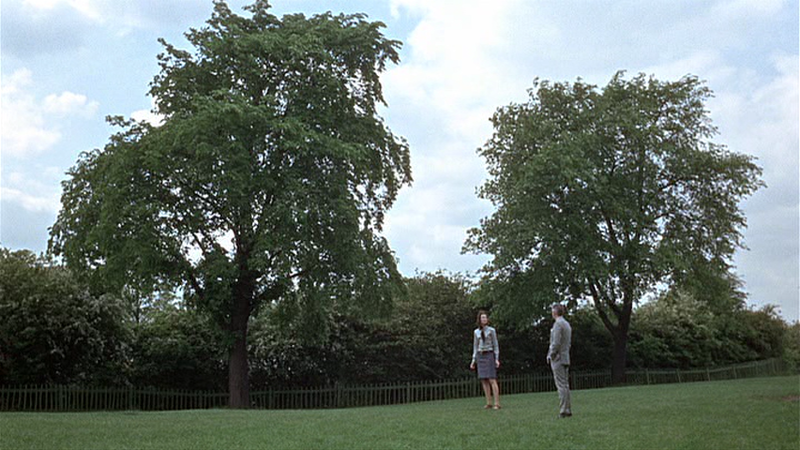 Famously, Antonioni had Gorton paint a park, because the colours had changed since they location-scouted it and it no longer fitted the scheme. I couldn’t say for sure that the park looks different from a natural one, but I certainly FEEL it does — it seems flatter, more uniform and graphic. Aided by overcast English skies, the park becomes a gray-green silhouette — sure, the shrubbery has shadows and weight, but it doesn’t sem to have ENOUGH. I always felt that, in scenes like the non-sequitur cross-talk purchase of a propeller from an antique shop, Antonioni was influenced by THE KNACK and its Ann Jellicoe-via-Charles Wood script, in which language becomes a kind of infestation, scrambling the characters’ brains and even pouring from their heads in the form of subtitles. Antonioni, working in an unfamiliar language, had the help of Edward Bond, but neither man is what you would call zany and so their attempts at a comedy of word soup floundering tends to fall rather painfully on its keys, but the very discomfort and flatness of it kind of suits the picture. In Jellicoe’s play, Tom, the Donal Donnelly character, repaints his room, stripping it of furniture and, I seem to recall, painting the shadows on the wall. And then he drives in a few nails so he can hang the chairs high off the floor. He doesn’t get that far in Richard Lester’s film, and he paints the room a featureless white, so that the various shapes look embossed, like MARIENBAD’s title sequence (Lester was a fan). Certianly Antonioni, who had been repainting reality in THE RED DESERT (1964), must have felt that Gorton was a kindred spirit. He just needed to THINK BIGGER.